When it’s cold and dark outside I love nothing more than having bright and colourful flowers at home (it was my birthday last week and I was very spoilt with lots of gorgeous bouquets!). The colours are amazing and it got me thinking about adding a sharp burst of colour to Winter weddings. Striking colours are often associated with summer weddings but we just love these Bridesmaids dresses to add glamour and a strong colour palette to any winter wedding. What do you think? 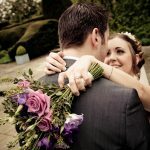 Louise and Kees were married back in May this year at the very unique Preston Court, near Canterbury. 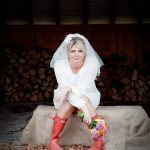 We asked the fabulous smiling bride, Lou to tell us about their day. It was the first and only venue we looked at. We knew it was the right venue for us straight away. 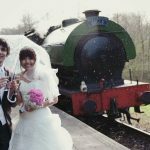 We booked it shortly after getting engaged just over 18 months before our wedding. We wanted to get married somewhere a bit different. 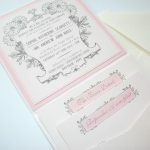 I absolutely love planning things so was in my element and Anna and Jenny at Preston Court were very helpful. There were 70 guests during the day with another 40 in the evening.We had an informal ceremony which was conducted outside with our guests sitting on picnic blankets. Two friends did readings from “No Matter What” and “Captain Corelli’s Mandolin”. 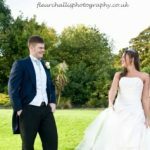 Who were your wedding photographer and videographers? We chose Laura and Jody from Lollypop Photography. 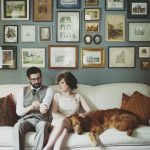 We did lots of research online into different styles of wedding photography, we looked through tons of photographer’s websites. 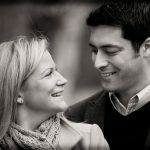 We then met with Laura and Jody and felt that they understood what we wanted to achieve and they really put us at ease. We also had a video by Andy and Nigel from Cine8. We got on well with Andy and Nigel and loved the vintage style of super 8 film. They even provided a guest Cine camera so our guests could have a go at filming too! 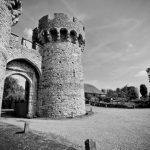 We had a ‘vintage’ them but basically we fell in love with the venue and fitted it around that. We just tended to buy things that we liked and hoped that it would all come together! 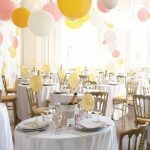 I handmade our table plan, place cards, table numbers and signs for the confetti cones and sweetie bar. I also made personalised colouring in books for all the children and letters out of gypsophelia for the backs of mine and Kees’ chairs. Our wooden directional signs were handmade by my sister and her husband and my mum and I sourced all vases and jars we needed from various places over 18 months. I made a basket of flip-flops, tied with bows for our guests to kick off their high heels and dance in the evening! 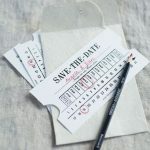 I painstakingly handmade all of our favours and most of our stationery using a personalised stamp. We wanted the colours to compliment the fairground organ in the barn so we used pastel pinks, blues, greens and greys. Who did your wedding flowers? My (very talented) mum did all the flowers, table centres, buttonholes, all floral decorations and bouquets, including a Jack Daniels bottle of flowers in the men’s loos! I had white peonies, Pink O’Hara roses and lamb’s ears (Stachys byzantina) as foliage. I picked flowers that I loved, my grandparents used to have lamb’s ears in their garden when I was a child. I spent many a weekend choosing flowers with my mum! Canapes: Fish and Skinny Chip Cones, Mini Hog Roast Burgers, Paneer Tikka Naans, Goat’s Cheese and Red Onion Tartlet. Tomato & Mozzarella Salad with rocket, and a drizzle of olive oil and balsamic. Main course was Chicken breast in a basil & honey cream sauce garnished with beetroot crisps, sautéed new potatoes and a medley of seasonal vegetables or Potato and Leek Tart with a butternut squash puree. We had a trio of desserts with Banoffee Pie, Baileys Eton Mess and Lemon Tart. The children had Garlic Doughballs, Chicken fillets with homemade potato wedges and fruit trifle. The food was amazing! How did you celebrate in the evening? It was a reasonably big party! Everyone was either dancing or on the carousel. As it was a lovely warm evening lots of people were relaxing outside plus trying the sweetie bar or photo booth. A memorable moment for me, was late in the evening when me and Kees were going round on the carousel. It was a lovely view point to watch all of our friends and family having a good time. If you could change one thing about your wedding day what would it be? I’d try and stop the day flying past so quickly! Also I would have had USB sticks available for guests to put their photos on and post to us while we were on honeymoon! Brides Shoes: Dune. Plus pink spotty converse – although I didn’t get round to wearing them! 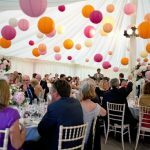 Caterers: Relish – the food was amazing! Band: The Redfords, who did an acoustic set in the day and then the full band in the evening. They were brilliant, everyone loved them. Our first dance was to JJ Heller – When I’m With You. 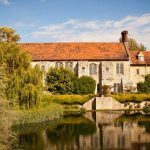 Felicity and Simon Howe were married at The Great Barn Rolvenden, near Tenterden in Kent. This wedding has all our favourite elements of a Kent affair and we just love the atmosphere that’s been captured so beautifully by photographer, Rebecca Douglas. 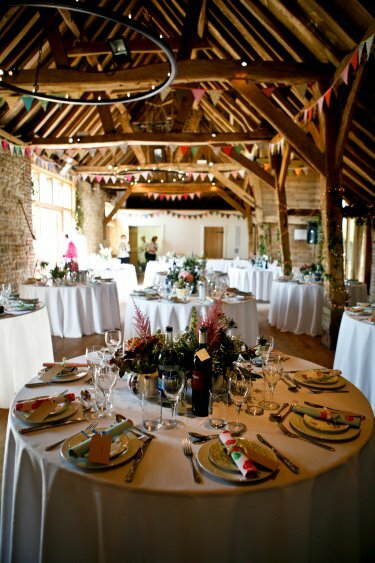 Our civil ceremony was in the barn itself, with all our guests. It has two floors so we were able to have a separate area for the ceremony and reception. It was a really sunny afternoon so after the ceremony we went outside to the Orchard for Pimms, Gin and Tonics and tubs of handmade luxury ice cream – we had lots of fun picking out our favourites for our guests. We just had to make sure we got photos with the children before they ate their chocolate ones! We had a buffet style barbeque with steak, lamb, local sausages and salads. For dessert, we served homemade chocolate brownies, which my Bridesmaid Tillie and I baked the day before. As well as local wine and ale, we included Keo lager to drink as this is a family favourite from Cyprus where I used to live as a child. After we were all full to the brim we chatted with guests in the Orchard, sitting on hay bales and enjoying the early evening sun. It was really relaxed and everyone was in such a good mood. It was lovely to get the chance to catch up with all our guests, particularly those who had come a long way. My dad is a natural performer and was in his element, delivering his speech and Simon and his best man Rob got a chance to celebrate their ‘bromance’, having been best friends since primary school. 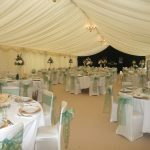 Australian Style Catering – they couldn’t do more to help and the food was perfect, in very generous portions! 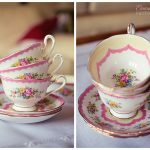 If you’re having a vintage wedding or traditional afternoon tea theme then you’ll love Alice and the teacup who hire vintage crockery and accessories in Kent and Sussex. 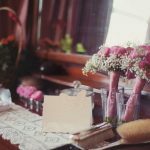 As well as a beautiful range of vintage crockery, Clair also has for hire linen, glassware, cutlery, vintage furniture pieces and accessories to really give any wedding a fabulous vintage theme. Prices range from £1.50 per cup and saucer to £6.00 for a 3-tier cake stand. Plus they have a gaggle of ‘tea ladies’ that are available to serve in vintage inspired uniform as well as a washing up service. So you get all of the benefits and none of the hard work. Exactly what you need on your wedding day!